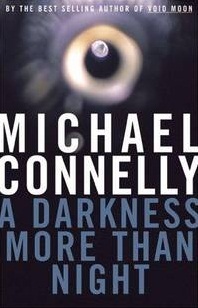 A Darkness More Than Night is the tenth novel by American crime author Michael Connelly; it is the seventh featuring the Los Angeles detective Hieronymus "Harry" Bosch, and the second featuring FBI profiler Terry McCaleb, with reporter Jack McEvoy (The Poet) also making an appearance in a supporting role. Terry McCaleb and Graciela Rivers have married and have an infant daughter named Cielo, and McCaleb's fishing charter business is running full-time on Catalina Island. Nevertheless, sheriff's deputy Jaye Winston brings McCaleb a file involving a murder scene filled with exotic elements and asks McCaleb to take a look at it, as the police have gotten nowhere. As McCaleb analyzes the clues, they seem to point straight toward Harry Bosch, whom McCaleb knows from a previous investigation before his retirement. Bosch is currently a key witness in a separate high-profile murder case involving a movie director, and author/reporter Jack McEvoy, who wrote The Poet, is covering the case. After McCaleb alerts the police to Bosch's probable involvement in the murder, Bosch goes to Catalina himself to challenge McCaleb's work and to ask him to re-examine the evidence. Based on a parking ticket that McCaleb finds, he concludes that Bosch may have been set up by the director in order to discredit his evidence in the court case, but the key evidence in proving that is a post office surveillance tape that was in the process of being erased, and from which nothing usable can be recovered. Nevertheless, Bosch and McCaleb pretend that they have recovered something from the tape, and the real killer in the second case (an ex-cop that handled security for the director) then targets and almost kills McCaleb. Bosch saves McCaleb and captures the ex-cop, while killing his younger brother. In return for not being charged with felony-murder in his brother's death, the ex-cop turns over evidence implicating the director in the frame of Bosch, and the director agrees to plead guilty to murder in a plea bargain seen by only McEvoy (who got a tip from Bosch) among the reporters. However, McCaleb realizes that Bosch was around to save him only because Bosch knew all the details of the potential frame, which Bosch had lied about to McCaleb, and McCaleb breaks off any renewed relationship with Bosch as a result. Bosch then "baptizes" himself in a plan for a fresh start. The novel was nominated for the 2002 Barry Award for "Best Novel". ^ Zackel, Frederick (March 2001). "Review | A Darkness More Than Night by Michael Connelly". January Magazine. Retrieved 2012-04-05. ^ "A Darkness More Than Night by Michael Connelly". Kirkus Reviews. 2000-10-01. Retrieved 2012-04-05. ^ "Deadly Pleasures Mystery Magazine- Barry Awards". Deadly Pleasures. Archived from the original on 2012-04-23. Retrieved 2012-04-05. This page was last edited on 28 September 2018, at 21:16 (UTC).